I installed the program as described here. Unfortunately, I get the following error when logging into the app "unknown error: 301". The Live helper chat is installed at the path https://mydomain.de/livechat. It would be nice, if someone can help me please. you need to wait a reply from the mobile app developers (unofficial support). I get an answer here in the forum? Sure, maybe is scalior who will reply you as soon as possible. I suggest to be sure to have follow all steps in that topic, please hold on for a reply here. Thanks, that is very nice. 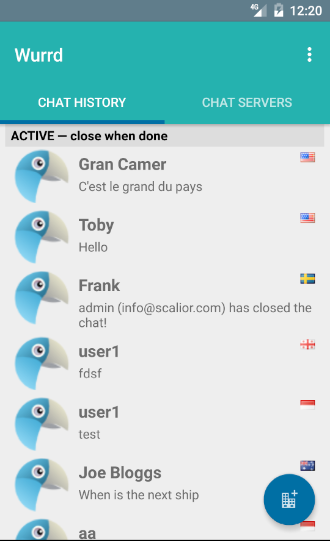 Is there any other way to use LiveHelperChat on mobile-phone (with an another app)? For this update (version 1.2.2.32 of the app) we are now exposing additional information about a chat. This includes information such as email, IP address, and other location data. One would have to install version 1.0.4 or greater of the extension to get all of these features on the app. To install or update your extension visit the OP above. The updated extension (1.0.4) has an important bug fix for the "session timed out" auto logout issue which continues to plague us. It is advised to everyone update to this version. The "Visitor Detail" screen can be reached by going into a specific chat and tapping "Menu -> Details" (see screenshot below). Email: In our usage we found that we occasionally wanted to know the visitor's email address and may be copy it for use in other apps. If the visitor provided an email when starting the chat, the email field will be populated and will include an icon to copy the email address to the clipboard. Note that if you want to collect email addresses from your website visitors you should enable this on the LHC admin interface by going to "Settings -> Live help configuration -> Start chat form settings -> Online form settings". Check the two "This field is visible..." checkboxes as you see fit. Location: If geo detection is properly enabled, location data will flow to the app. This is configured by going to "Settings -> Live help configuration -> GEO detection configuration". By default, MaxMind is enabled and this provides only country-level detection. With this setting, the app will only show the country name and one will not have the option of plotting the location on a map. To provide more accurate geo detection with MaxMind, you would have to install the city-based database on your server. This is outside the scope of this discussion but I can entertain questions on this later. We also tested with the "freegeoip.net" option and were able to get city level detection without any additional setup. With more detailed location information an icon will be displayed and you can tap it to see the visitor's location on a map. Another change is that the "Chat history" screen now shows the country flag of a chat if that information is available (see screenshot below). I see there is a new version. Can you please write the changelog? Thanks! No matter where I try to add it, I receive an error on the installation page: This page is not working properly. I've just tested this and I love it! It means I don't have to be tied to my PC to provide support. Is there a way to change the notification sound, or does it just use the system default on my Android device? it uses the default system sound. A future enhancement could be to make the sound configurable. I was also facing the same issue to install .. I am getting "Unknow error: Code = 403" when logging on wurrd app. Have you run it through this diagnostic test on the link below? From the test results it shows that if you configure the extension to use POST all should work well. Given that everyone's server setup is a little different one has to deal with this on a case-by-case basis. Please reach out to us via email at ***.com so that I can help you better. Where am I wrong? Thanks so much. 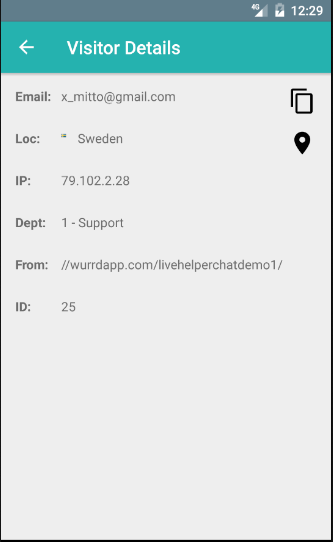 Wurrd doesn't seem to be working with fbmessenger plugin (https://livehelperchat.com/integration- … -464a.html). It sends the reply, you can see it in LHC panel but the user doesn't get anything. Can you do something to fix it?